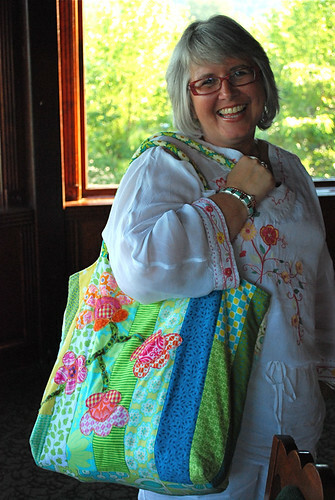 Fabulous fun with fabric friends - Stop staring and start sewing! On my last night in Portland I got to enjoy the vacation icing on the cake. 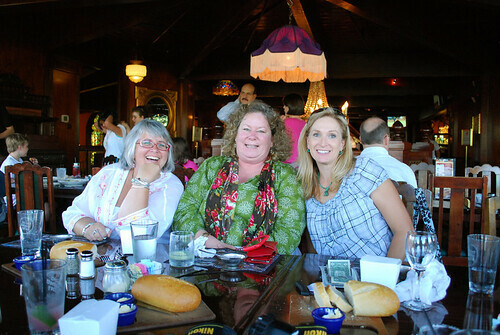 I met up with a bunch of gals who were together for the Portland Modern Quilt Guild gathering. Lucky me! Here's the part where you get to see my selfish side: I told Joey that we could all go to the Old Spaghetti Factory together but I was going to eat upstairs with my friends while he ate downstairs with all 5 kids. Yes, it's true. We had promised the kids we'd go there so this was a way to make everyone happy (except maybe Joey). He's very nice to me. You know what I love about fabric people? They all love getting together with other fabric people. So much fun and giggling and picture taking. I got to see some old friends and meet some new friends (some I knew only online before). Here are Tammy Gilley, Monica Solario-Snow (yes, The Happy Zombie herself! ), and myself. I'm bummed that I only got to spend these few minutes with Monica but I would've been in a deep dark depression if I hadn't gotten to see her at all. I'll start with the front row here (I hope I get this right! ): Terri, Mo, Violet, Traci. 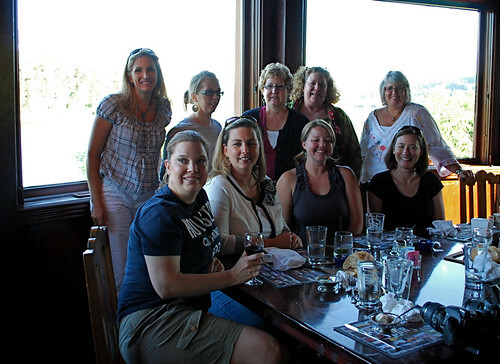 Back row: Me, Heather, Joan, Monica, Tammy. So much fun and so much fabric was changing hands and Heather was showing us her lovely hexies (she has a beautiful obsession). The perfect finish to a perfect vacation. Look at Tammy's bag!! 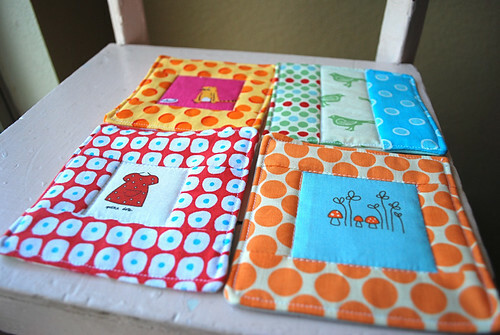 If you want to see some cute purses you need to get together with fabric people. You'll always see the cutest bags. Isn't Tammy so pretty?! We left the next morning for the long drive home. 23 hours total (7 people stuffed in a mini van with a lot more luggage than we came with)! I was so inspired by the Portland Modern Quilt Guild that I thought it would be fun to start one up here in Phoenix. I googled it and realized there already was a Phoenix Modern Quilt Guild. And I was a member! I forgot that I had joined the group in the spring and then just forgotten about it. The former leader had bowed out and I was glad that she was willing to hand the reins over to me. I asked my BFF (best fabric friend!) Jamie if she would co-lead with me and she said yes (I knew she would!). So if you're in the Phoenix area you can join us here on Facebook and here at the current site. I'm going to start a blog and get rid of the old site but it's a place to meet for now. Yay! 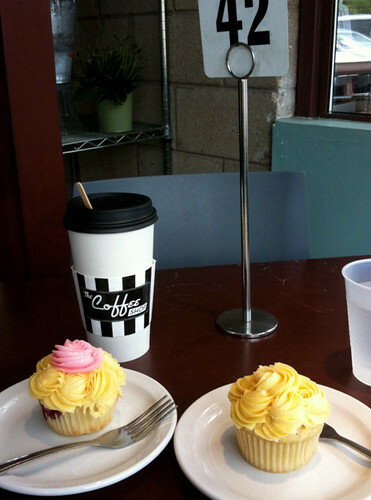 We'll meet at cool places like this: The Coffee Shop, which is owned our local gals who won Cupcake Wars last month. This is my belated birthday breakfast from Jamie. I got her the same thing on her birthday (which is 4 days before mine). We've started a tradition. And here's my birthday gift from Jamie...these gorgeous coasters! I swear if someone even sets a cup next to them I'll break their fingers. Just sayin'. Aren't they cute?? Anyway, the big sale is still going on at Fabritopia (5 more days) and we'll have some new stuff going on real soon. We're trying to "diversify" (and figure out what that looks like in a little fabric store)! I hope you're having a great week!